SUNRISE. A midsummer nights party. £155 - It's all about flyers! I smell a rat mr.wigs on this one,a bit of eBay shill bidding going on ! Ruma wrote: I smell a rat mr.wigs on this one,a bit of eBay shill bidding going on ! I think you could be right on this one. To have more than one person willing to bid as high as that certainly doesn't seem real. 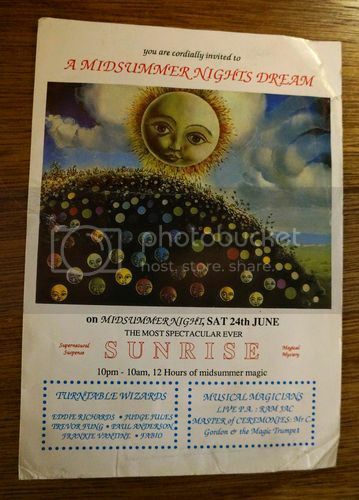 Im not sure if this was myself but 4 people bidding over £100 on this Sunrise is unusual. Private bidder 'sgdst' has spent a fortune just with this seller, £534 (inc P&P) for 10 flyers.